Most everyone knows about the famous town of Tombstone, but you may not have heard of Fairbank, just a few miles north. Now a ghost town, it was founded in 1881 and served as a central point of entry and exit for miners, prospectors, materials, and ore. The town was named after Nathanial Kellogg Fairbank, a Chicago grain broker who helped finance the railroad and was a founding member of Grand Central Mining Company in Tombstone. In 1881 the New Mexico and Arizona Railroad built a line from Benson to Fairbank, where tracks turned west and headed to Nogales. Passengers arriving at Fairbank would ride a stagecoach to Tombstone for $1.50. During the 1880s, Fairbank grew in population to about 200 residents. The town had several houses, a depot, four stores, a mercantile, saloons, restaurants, a school, and a hotel. The Montezuma Hotel was built in 1889 to serve railroad passengers. It was damaged by flood in 1894, and rebuilt higher up on a stone platform, visible in this photo. It was torn down in the 1940s for construction of Highway 82. The depot was built in 1892 to serve passengers and freight going to and from Tombstone. A spur track and depot in Tombstone was not built until 1903. One account said that the depot building burned down; another said it was eventually moved to Tombstone. The most notorious event in Fairbank's colorful history was the attempted train robbery of February 15, 1900. An outlaw gang, led by "Three Finger Jack" Dunlap, waited at the Fairbank station to rob the Wells Fargo boxcar. Jeff Milton, an ex-Texas Ranger and respected Arizona lawman, was guarding the safe that day, and was able to foil the raid. Two robbers were shot, one fled to Mexico, and three were captured. 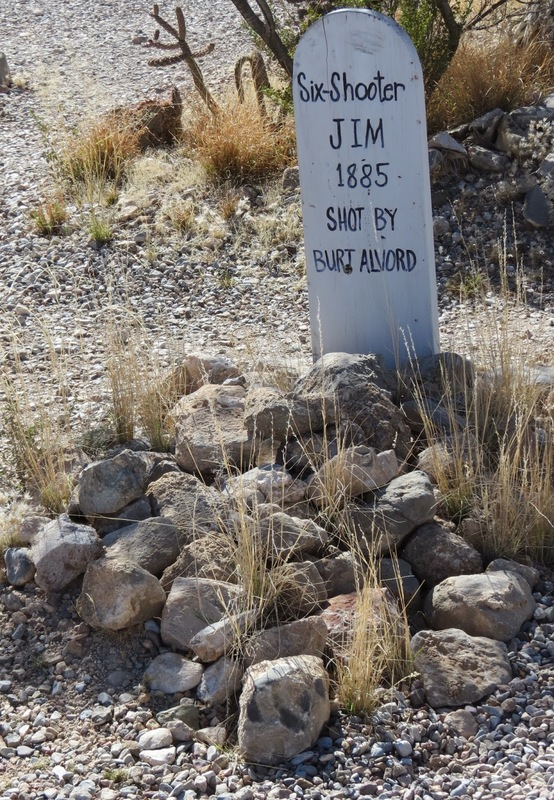 3-fingered Jack died of his wounds and is buried in the cemetery at Tombstone. The house that remains standing in Fairbank is referred to as the "teacher's house." It is across the street from the school and teachers lived in it until the school closed in 1944. THe outbuildings include stables and outhouses. The mercantile dates to 1882 and was open for business until 1973. Over the years it housed stores, restaurants, a post office, saloon, gas station, and jail. Among the business owners was Joseph Goldwater, great uncle of US Senator Barry Goldwater. The first Fairbank school was built in 1884. That wooden structure burned down in 1920 and was replaced by this gypsum block building. Up to 45 children attended, grades 1 to 8. One or two teachers worked here. The school also served as a community center. THe school was closed in 1944, and students were transferred to Tombstone. The schoolhouse is open weekends as a visitor center. The volunteer grew up in Fairbank. Fairbank has its own "Boothill Cemetery," and we decided to walk to it. The cemetery is located on a hill about halfway between Fairbank and the mine ruins. And truly an old cemetery, not restored with fresh-painted tombstones for tourists to read. Most of the wooden crosses are rotted, and no trace of writing remains. Only a few of the dead have been identified in the town records. We found two with names and dates...this one 1885. Fairbank is only a mile and a half from our campground, seen in the distance. From Fairbank we went to Tombstone...not a ghost town, but surely a tourist attraction. We were told that the Famous Boothill Cemetery was once much larger and extended down into the business district you see behind the sign. Those graves have been relocated, leaving only the most historic graves from the late 1800s. Boothill Cemetery looked a lot like Fairbank Cemetery before it was restored in the late 1920s using early burial records as a guide. Both Fairbank and Tombstone had a Chinese population...who came here workers to build the railroad. Many of the graves are marked "unknown." Then into Tombstone itself which entertains tourists with the "Old West" theme. You have to pay to actually see the scene of the famous shootout. Actors roam the streets in character to entice tourists to the shows. 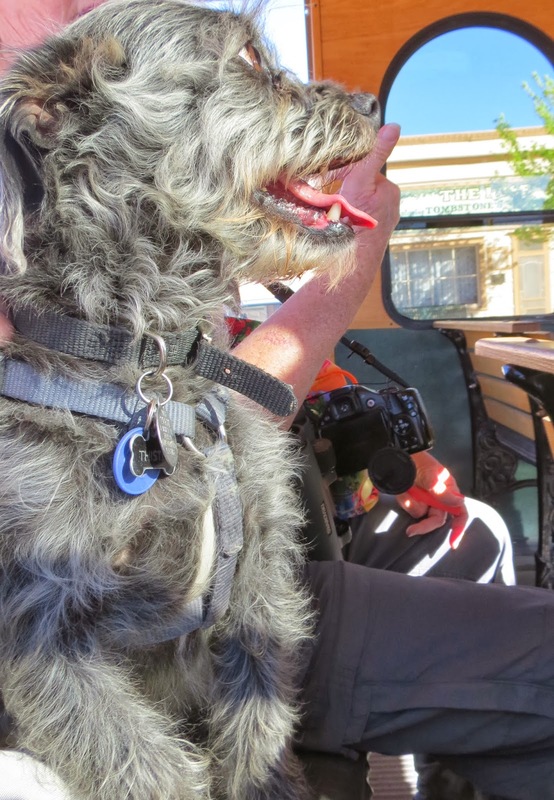 You can tour the town by stagecoach. The famous courthouse, scene of hangings and lynchings. 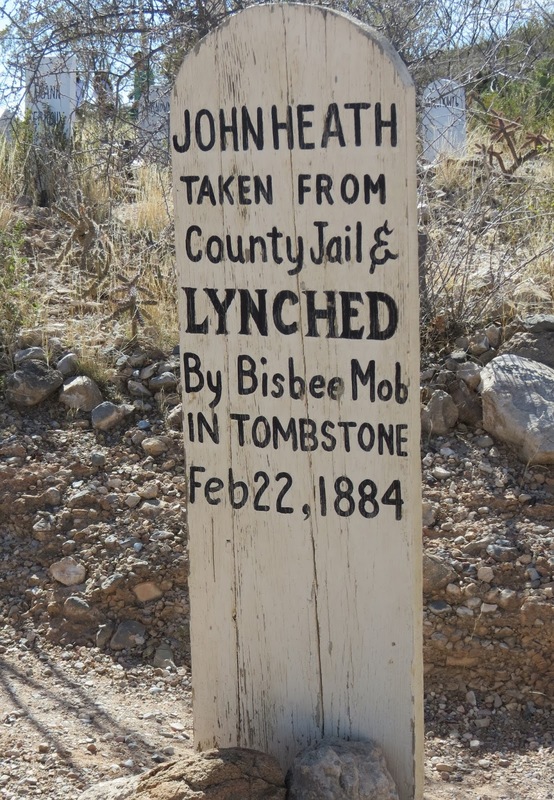 Ed Shieffelin founded Tombstone by filing a mining claim in 1878. Supposedly Tombstone's oldest house....I forget the details. The famous OK Corral is behind this building. We didn't pay to go in. So the tour pointed out historical landmarks and also promoted restaurants, shows, and other tourist draws. It was faster than walking. Sounds like you and Birdie had a fun day. 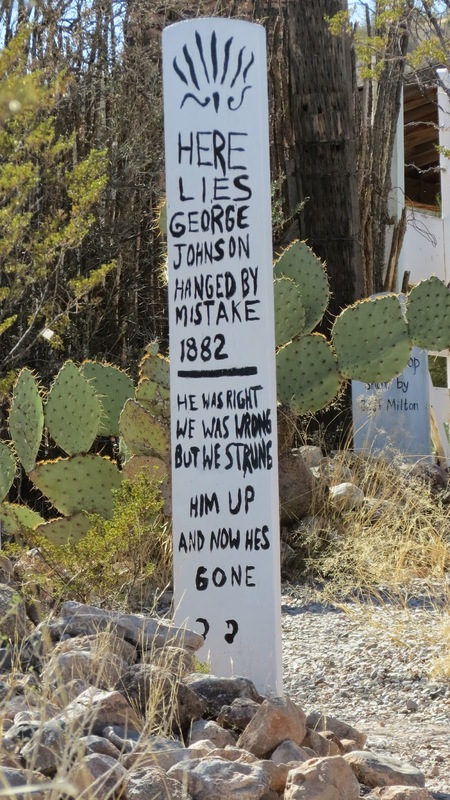 Great place to visit if you like Old West History. I recommend checking out Fairbank although it might be boring for some. great view from the graveyard.